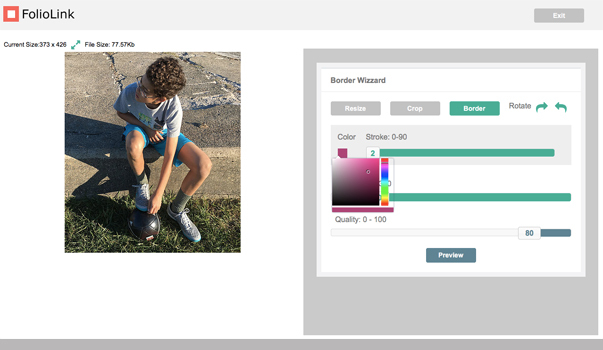 The FolioLink team recently undertook a significant effort to streamline the workflow of the Image Editor. 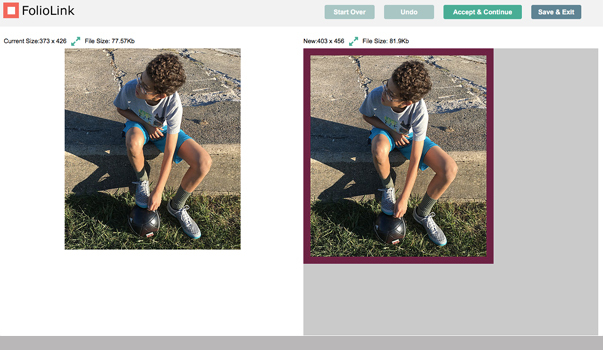 The new Image Editor is HTML based, supports various devices including tablets, and gives you before and after editing results so that you can see your changes prior to posting them on your website. 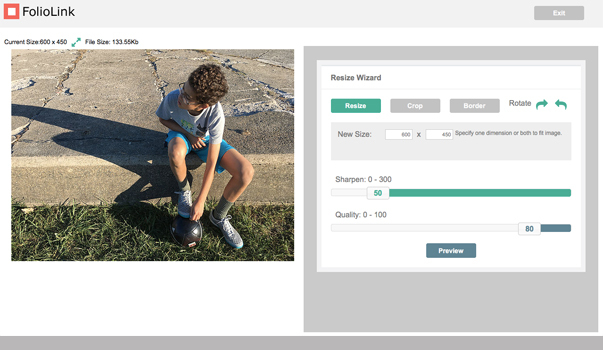 The Image Editor includes multi-step editing making it easy to resize, crop and add borders all in one session. Easy resize! Specify one dimension and let FolioLink auto calculate the other or set both width and height. Then preview the new size before committing to the change. 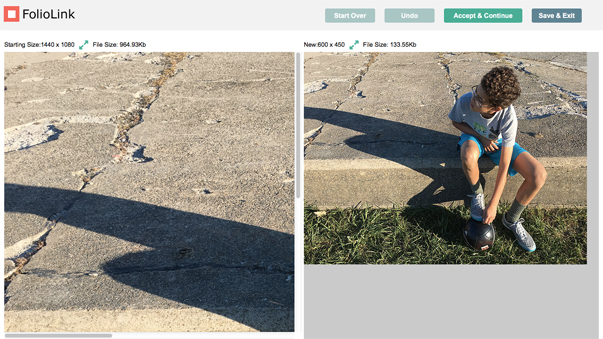 After resizing an image you can choose to Accept and Continue to proceed with editing your file. Notice how your image moves to the left hand side of the screen where the original file used to appear. Now the file is shown at its new size. 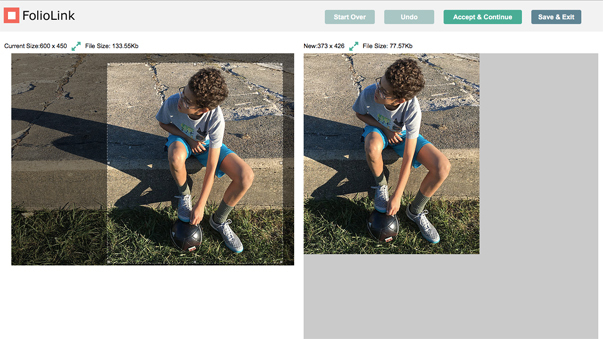 To crop the image you can either set a specific crop window size or resize the box to highlight and crop to the area of interest. Whether or not you choose to resize or crop you can add special borders of any size and color. In this next case we are adding a border after cropping the image. Notice the Color tool that allows you to select a specific color. To the right of the Color tool is the Stroke setting that allows you to set the border width. At all times your original file remains intact making it possible to undo your edits and start over. 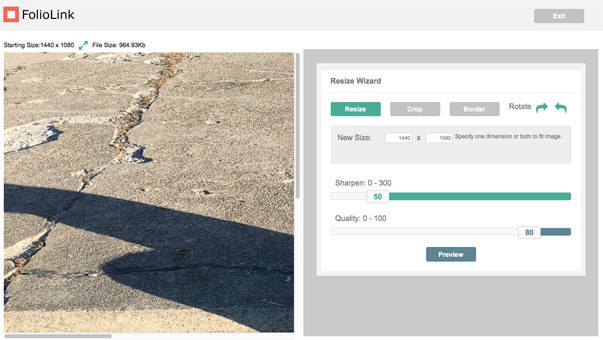 Batch Resize Reminder: the image editor described above is for single image editing. For your convenience, FolioLink includes powerful batch editing tools for re-sizing files en-masse, standardizing thumbnail presentation, controlling image captions, sales information and search engine optimization fields. Files can be batch edited on a per-portfolio basis or globally and applied to all images in your website.